"We had a blast on this trip and we learned a lot as well"
If you like world class wine and fine dining, I could not recommend this trip more highly. "It is hard to imagine other people in the world drinking as well as we did"
If you are contemplating signing up for this tour, do yourself a favor and book right away before it is sold out! "The only word I can use to describe this experience is epic!" I can’t think of a better way to experience Bordeaux. We hope to return many more times in the future. "This tour is a wine lovers dream come true!" "This trip is the ultimate adventure for fine wine lovers"
Meals were top notch and wines superb. Trip of a lifetime and extremely well done. Don’t miss it! "This is the best wine experience in Bordeaux!" We enjoyed ourselves and learned so many new things. Thank you for making us so feel like family. 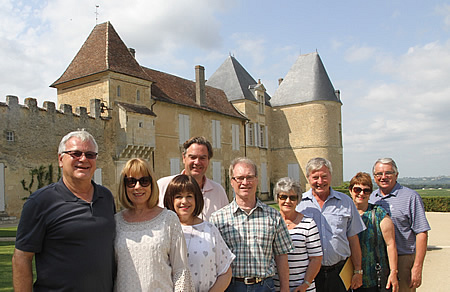 "Your connections in the area led us to chateaux we’ve only dreamed of!" I have loved Bordeaux wines for a time, but now I am in love with Bordeaux! "This will remain with us forever, and that’s priceless"
I felt we were in the company of very good friends that we have known for years. "The Bordeaux Wine Experience is a truly unique experience"
A little bit of heaven in Bordeaux -mixed lightly with warmth, hospitality, laughter and wine! "We had one of the best trips of our life!" Thanks for the great educational and memorable experiences both of you gave us. "The tour was magical, educational, and delicious in every way"
We have walked the earth enough; and traveled a lot and this was the most happiest and warm holiday we have ever had. "This was the best money we’ve ever spent on a vacation – bar none!" We saw the Bordeaux region at its best and tasted wine at places neither one of us thought we would ever get into. "The BEST vacation of our lives – and we’ve traveled a lot!" This trip was more than we could have hoped for. We cannot recommend the Bordeaux Wine Experience highly enough. 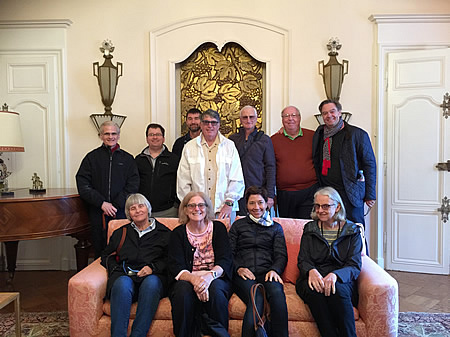 "Your hospitality and great sense of humor was the frosting on the cake"
All-inclusive small-group Bordeaux Wine Tours (6 days, 5 nights). Personalized visits and tastings at Bordeaux’s best wineries. The unique Bordeaux Wine Experience atmosphere. Taste over 60 wines including all 5 First Growths and Château d’Yquem! Ronald Rens, M. Sc., Wine Master. 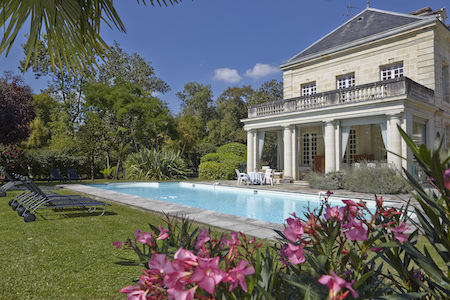 Intimate gourmet meals and exclusive accommodation at a private Chateau! 100% satisfied and delighted guests: many coming back for 2, 3 or even 4 times! You want a Bordeaux Wine Experience and not “simply” a Bordeaux wine tour! Why do our guests rave about our Bordeaux Wine Tours? Surely they adore the Chateau-meals in venues not open to the public. Of course they love tasting all five First Growths with fellow wine lovers, especially comparing Lafite Rothschild 1985 to Margaux 1985 in our chateau dining room. Discovering museums, gardens and historical monuments are highlights as well. But what our guests rave the most about is their personal experience with us. And the great fun combined with behind-the-scenes insights. Or in their words: “all those things you include that we simply can’t buy, not for any money in the world!” There is a reason that our company is called the Bordeaux Wine Experience as this is a once-in-a-lifetime experience that you will never forget. 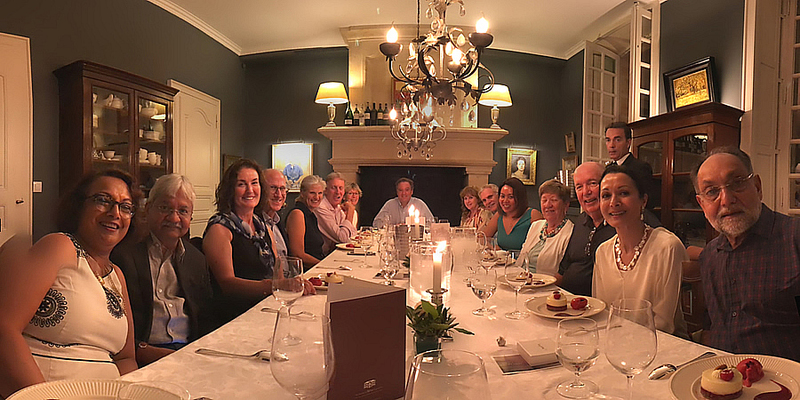 You will experience Bordeaux bonded with a handful of like-minded wine lovers who want to understand and taste fine wines, eat amazing food and enjoy tales of the vines, life in France and the wit and wisdom of your tour-host Ronald Rens. He knows his wines and the Bordeaux area and he is very good at presenting his knowledge to any level of wine connoisseur. Ronald has a way of telling a story that keeps you engaged and laughing the entire trip. Checking into the Chateau for the first night of your adventure, you will be greeted by the gregarious Ronald and the lovely Margaret who shows you to one of the handful of beautifully appointed rooms on the property. Somehow a glass of champagne gets slipped into you hand and the adventure begins. Ronald and Margaret layer surprise upon surprise with such attention to detail that the phrase ‘exceeds your expectations’ begins to become inadequate. 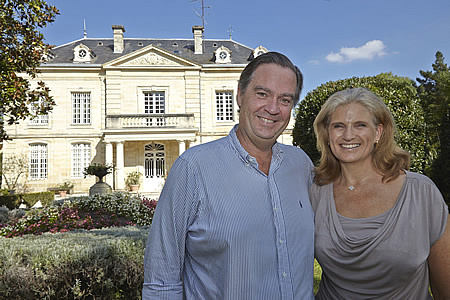 Ronald and Margaret have spent many years becoming an integral part of the Bordeaux wine scene. That’s how they can open doors to wine chateaus and adventures that would be impossible without having the right connections. Not only is the tour informative and educational for a wine enthusiast or novice, it is tremendous fun. Bordeaux wine lovers you will not leave disappointed. New to wine and Bordeaux, you will leave knowledgeable. To all, you will come to experience (there is that word again) what makes Bordeaux special – from the terroir to the techniques that each Chateau brings to their bottles, honed over, in most cases, centuries of their art and craft. 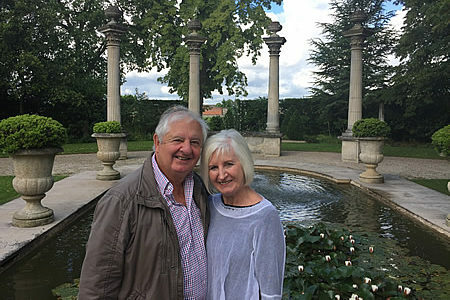 You will come to experience the special people that Ronald and Margaret are who have created a very special adventure that has as much to do with who they are as where this tour visits. You soon realize that for team Margaret & Ronald this is not simply another job or another tour group. This is their passion, and you will feel very fortunate to be a part of it. Learn about French wines, food and culture, filled with humor and a wealth of wine knowledge. 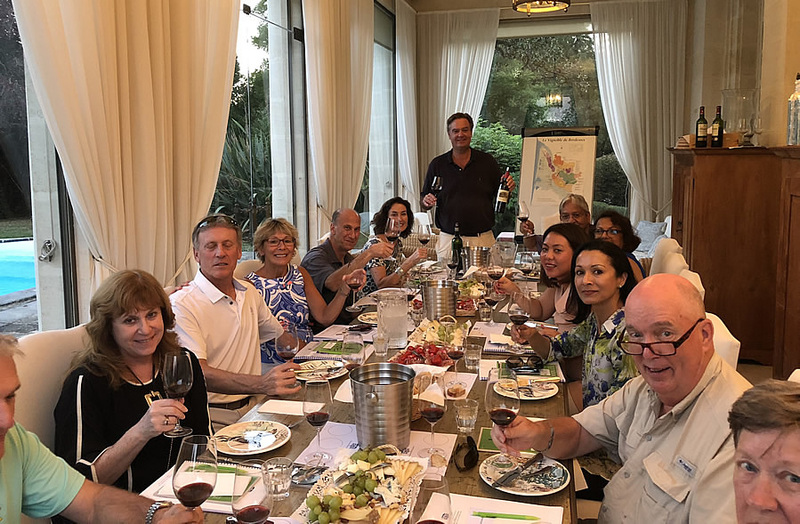 As the tour progresses you will come to realize and appreciate Ronald’s vast knowledge of wines and wine making, the history of Bordeaux, his outstanding network of wine makers, amusing stories and of course the wine tastings. Ronald’s expertise and the easygoing manner in which he shares his extensive knowledge of Bordeaux and its wines are conveyed in a very charming and witty fashion – which is designed to please rather than intimidate. 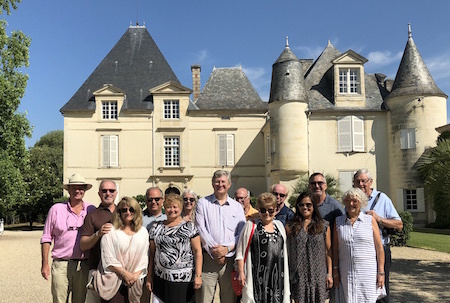 As part of the tour group you are automatically beneficiary of all his many years of hard work that featured visits to exceptional chateaux, and tastings of many superior Bordeaux vintages. Behind the scenes Margaret and Ronald put a great deal of attention to detail. As a result everything will go very smoothly, and you will be made to feel very special. Imagine visiting First Growth and Grand Cru vineyards from an insider perspective, savoring lunches prepared by top Chefs within the winery itself, and enjoying the experience in a very intimate and relaxed setting. Ronald and Margaret will go out of their way to make you feel at home. Margaret enhances the food experience and makes you feel welcome from the moment you arrive. Ronald is the quintessential host, who is very knowledgeable about wine, food and life. He is passionate about wine and intimately involved with his guests having a special experience. To be granted access to the most prestigious Chateaus in Bordeaux where is will be clear from their interactions that Ronald has long established personal relationships will be an unforgettable experience.